Nothing more dangerous than a friend without discretion; even a prudent enemy is preferable. We may to prudence bid adieu. Folly was condemned to serve as a guide to Love whom she had blinded. Man is so made that whenever anything fires his soul, impossibilities vanish. We then saw what St. Jerome said of those who serve God and those who serve the world: "Each to the other we seem insane": Invicem insanire videmur. There is a never-ending duel between the two. By time and toil we sever What strength and rage could never. Garde-toi, tant que tu vivras, De juger des gens sur la mine. Beware as long as you live, Of judging others according to appearance alone. To win a race, the swiftness of a dart availeth not without a timely start. Better to suffer than to die: that is mankind's motto. That men may get instruction from their voice. To live lightheartedly but not recklessly; to be gay without being boisterous; to be courageous without being bold; to show trust and cheerful resignation without fatalism — this is the art of living. There's nothing sweeter than a real friend: Not only is he prompt to lend— An angler delicate, he fishes The very deepest of your wishes, And spares your modesty the task His friendly aid to ask. A dream, a shadow, wakes his fear, When pointing at the object dear. 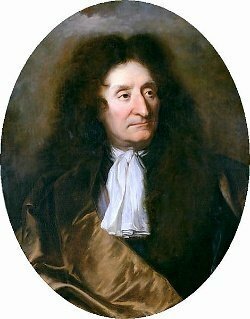 Bio: Jean de La Fontaine was the most famous French fabulist and one of the most widely read French poets of the 17th century.